What if I told you that you could own an online store and sell products from anywhere in the world with no start up capital or inventory. 1. You can sell products on Ebay.com, Esty.com or Amazon.com with no start up cost of inventory. Ebay, Esty and Amazon provides you with the platform to sell products, there is no upfront cost, but they do take a fee percentage when you sell a product. Ebay, Amazon and Esty have thousands or even millions of visitors daily, that is great opportunity for thousands of people to see the products that you are selling online and to buy them from you. On Amazon and Ebay, you can create a seller account and add products to sell. 2. 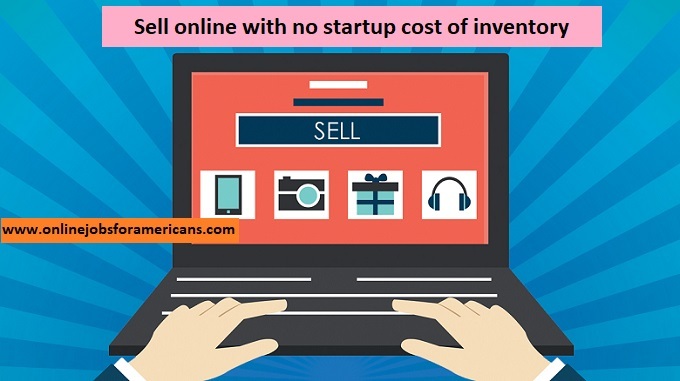 You can also sell products on your own online store. If you don’t already have a hosting provider and a registered domain, then you would have to purchase those. Or you can open your very own online store on an established platform such like salehoo or shopify. How do I get paid when I sell online? Payoneer and Paypal are the two main payment services that helps you to get paid when you sell online and to get cash in your hands, especially if you are not from the US. You may receive payment through Paypal or a U.S checking account or a bank account located in the U.K. or any of the other countries located in the eurozone (France, Italy, Luxembourg, Cyprus, Estonia, Portugal, the Netherlands, Austria, Slovakia, Slovenia,Greece, Ireland, Finland, Germany, Belgium, Malta, Spain, Australia, New Zealand, India, Hong Kong or Canada). In addition to Ebay charging you a 10% fee, Paypal will charge you $0.30 + 2.9% of sales price to process each sale transaction. The good thing is, you only get charged if you make a sale. Where do I get the products to sell online? If you know anything about the retail business, you know that you have to first buy the product from a source and then sell it at a higher cost to earn a profit. But there is a way to sell products online for a profit without buying them from a source or shipping it to the buyer. This method is called dropshipping. 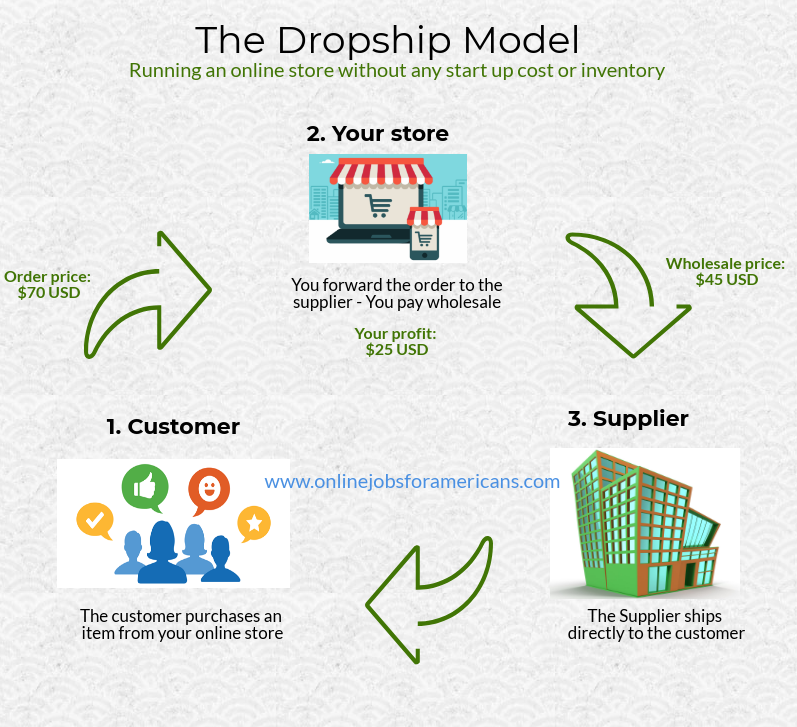 Dropshipping is the method by which you advertises the product on your store for a particular price and once a customer buys the product, you the product from a manufacturer (these are called dropshippers) for a cheaper cost and the manufacturer ships the product directly to the customers. This way you don’t store the stock nor do you handle the shipment, the manufacturer handles the storage and shipment of the goods to the customer. The way you make your profit is to sell the product on your store to the customer at a higher price, than you will buy it from the manufacturer. So in essence you act as a middleman between the customer and the manufacture and make a profit from the transaction. Dropshipping is reason why a lot of sellers all over the world on Ebay, Amazon and other platforms can sell products at no start up cost, with no inventory and no shipping worries. Now that you know what is dropshipping and how you can skip the step of shipping to customers or storing inventory, let’s look at an example. Let’s say you a jewelry online from a Manufacturethat you would like to sell on your ebay store (or another platform) and you saw this jewelry for $20 USD. You then decide you want to sell this product on ebay, so you post an image of product along with the description and details (that you got from the manufaturer site) on ebay and you mark up the price up to $38 USD (Taking into consideration the fees). When someone buys the jewelry from your store, you take the $38 that you got for the sale and buy the jewelry from the manufacturer for $20. After you take out all the fees, you will be left with a profit of about $10. And that’s from one sale. Imagine doing multiple sales per day. Imagine selling more expensive products per day and making greater profits per sale. It is important to note that sometimes when the buyers buy from you on ebay you might not receive the cash immediately (this is to protect buyers in case of re-fund or complaint). So it’s important to have a bit of cash reserve until you start to build your reputation on these platforms and you get enough cash flow in the business to sustain itself. How do I find these dropshippers? So where do you find these list of manufacturers with products to sell? 1. The first is the easiest and most recommended way is with Salehoo. This method is very fast and effective and it has a high quality list of over 8000+ approved manufaturers that has products in many categories that you can add to your online store for free. The products that they list ranges from jewelry, phones, toys, books, antiques, bags, clothes, shoes, batteries, etc. They have a lot of legitimate dropshippers to choose from. 2. The second method is to use google to research dropshippers in your category by typing into google “‘your category’ dropshipper”. Now this method is very tedious, will take a lot of time and sometimes when you check out the dropshippers you may not like them for one reason or another, for example they may be asking for some sort of business documents. Pro tip: when searching for dropshippers on google, do you due diligence, and avoid scams. For those reasons I highly recommend Salehoo. You can see the pros and cons of salehoo in this salehoo review. Always keep in communication with the dropshipper/check their database to ensure that the products that you are selling on Ebay is in stock. Ensure to name your product properly on Ebay or Amazon, else you run the risk of your products not showing up in ebay/amazon search results like it should, and thus you’ll end up missing sales opportunities. You should optimize the title of you product with good description. Let’s say for example you are selling a red Samsung Galaxy S4, and it is ‘unlocked’. You shouldn’t just name your listing, ‘Samsung Galaxy S4’, you should be more specific and optimize the listing in accordance to what someone might be looking for. So maybe you would want to have this for your product title instead, ‘Red Samsung Galaxy S4 Unlocked – New’ or something of that effect.